Have school age children? Want to save $$ on park tickets? Are you planning a trip to Disney and want to know how to incorporate something educational on your trip? Would you like to save money on your park tickets at the same time? This is an AWESOME deal if you can’t get that coveted Free Dining during your trip! Sign your school age child or children up for an educational class and you not only help them with learning something but you can get park tickets at an AWESOME deal! Check out Terri Miller’s website: www.wdwhints.com for full details on how this works. Have a travel agent? Let them see if this would be a better way to save you the most money. Terri wrote this review of an ebook that she read and I thought it was an awesome review. So much so that I just might have to get this ebook! I am SOOOO EXCITED!! I have a guest blogger who will be joining me on my website from time to time!!! She also blogs for Chip & Co., Undercover Tourist and has done some blogging on Mouse & Memo’s and My Dreams of Disney. Welcome Terri Miller! Check out her website: www.wdwhints.com. She is also on Facebook WDW Hints. Terri is a Christian wife and mother of 2 children. She started her website back in March. She read an outdated book on Disney and thought she could do this and give up-to-date information, so she started blogging. Her goal is to write an e-book and update it every year or two. She also knows what it is like to travel to Disney with allergies/auto-immune conditions. She has both. Please help me welcome Terri. I look forward to sharing her articles with you. How to upgrade your park hopper ticket to an annual pass. You can completely use up your park hopper and still upgrade if it’s within the 14-day period. You can even upgrade it from home. Although it is easier to do at Disney World. Did you know the date your annual pass starts is the first day you use your park hopper, so if your first park day was August 15th and you upgraded to an annual pass on August 20th, your pass would be backdated to August 15th. The cost of your pass is the difference between what your park hopper is worth and the cost of an Annual Pass. NOTE: If you bought your park hoppers tickets from a discount broker like Undercover Tourist, you probably got a savings of $10 or $20 from what Disney charges. Use your park hopper at least one day and you’ll get the full Disney price that day (even if you bought your tickets prior to a price increase). If you don’t use it, they’ll only give you the price that you paid your discount broker. 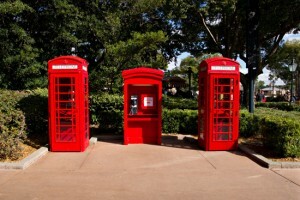 Have you seen these red phone booths in Epcot’s UK Pavilion of the World Showcase? Did you know that they are actually working phones with INCOMING lines that you can call? See if anyone visiting Disney will answer. If they answer see if they would like a Disney joke or Disney Trivia question. If you are at Disney World’s Epcot it would be hysterical to watch their reactions and witness the joy on their faces as they listen to the joke or Disney trivia. If you call, post your comments on what type of response you get…….. Here are a few good areas in the Magic Kingdom to view the Main Street Electrical Parade, Celebrate a Dream Come True Parade, and Wishes. 1. Tomorrowland Terrace – If you exit the bakery to the right you will come to the Tomorrowland Terrace. This is a great spot to watch the Move It! Shake It! Celebrate It! Street Party. 2. Close to your favorite rides – Once you find a spot to watch the parade or Wishes, you are “stuck” there until it’s over. So choose a spot close to your favorite ride or some of the more crowded rides. 3. Fantasyland – Right in front of Mickey’s Philharmagic they begin to rope off the walkway that leads through Cinderella’s Castle to Main Street USA. This is between Mickey’s Philharmagic and Cinderella’s Carousel. And the crowds in Fantasyland are fairly low during parades and Wishes. 4. Liberty Square – Right across from the flagpole in Liberty Square there is a small food stand. This is a great spot to watch the Main Street Electrical Parade or Celebrate a Dream Come True Parade. Then right after the parades you can head over to Big Thunder Mountain Railroad and Splash Mountain and ride these with little to no wait. Do you think making sculptures out of a plain ball of rice would be easy to do? Well Miyuki can mold a plain ball of rice candy into a sculpture in less than two minutes. She takes requests from the audience too. There are 15 trained “candy artists” in the world and Miyuki is the only woman. Several times a day at the Japan Pavilion of Disney’s Epcot, Miyuki creates sculptures out of candy. Her stage is located just outside the front entrance of Mitsukoshi department store. Where can you get dinner and watch the fireworks at Disney? Casey’s Corner in the Magic Kingdom – is an old-fashioned hot dog stand located at the castle end of Main Street. Casey’s Corner’s seating is mostly outdoor and is a perfect spot to eat and watch Wishes. Tomorrowland Terrace Fireworks Dessert Party in the Magic Kingdom – You will not be able to sit because it is a standing room only event, but it does offer a reserved spot for viewing the fireworks and offers desserts to snack on while waiting for Tinkerbell to FLY RIGHT OVER YOUR HEAD! The Tomorrowland Terrace restaurant is closed for this event and a dessert buffet offered. The cost is $15-$35.99 per person and reservations can be made by calling (407) WDW-DINE (939-3463) or contacting your travel agent. ‘Ohana at the Polynesian Resort – family-style restaurant is a perfect place for watching the Wishes fireworks show over the Magic Kingdom‘s Cinderella Castle. When the fireworks are about to start, the dining room’s lights are dimmed and the show’s music is piped in. For the 9:00 Wishes show, ask for 8:00 dinner reservations and request a table by a window. Note: You will not always get your window seat. California Grill at the Contemporary Resort – is on the 15th floor of the Contemporary. This restaurant is much more “upscale” than ‘Ohana and the menu changes weekly. This is also the very best place in the Walt Disney World Resorts to view the Wishes fireworks show. La Hacienda de San Angel in Epcot – the menu features Mexican dishes and the back tables are right on the World Showcase Lagoon. Rose and Crown Dining Room at Epcot’s World Showcase – is a pub-style restaurant with patio seating on the World Showcase Lagoon and is the perfect spot to view the IllumiNations fireworks and laser show. Reservations are HIGHLY recommended for all of these dining options. 1. Go to the Lego store. Out front there are stations and ramps where you can build your own race car and then race them. At the back of the store there are Lego tables with tons of Legos for kids to sit and play. 2. Take your photo with all the different Disney signs and statues throughout Downtown Disney. The Lego statues are really cool to be photographed with too. 3. Go over to Ghiradelli’s. The staff hands out free chocolate samples throughout the day. If you can avoid buying anything, the samples are free. 4. Hunt around for Hidden Mickey’s. 5. Let the kids play in the fountains or get squirted by Stitch at the World of Disney. 6. There are dance groups that perform on stage in front of the World of Disney every day. There is a sign announcing performance times by the stage. 7. Certain times of the year you can take your Christmas photo with special Disney characters for your Christmas card. Usually located near the bus entrance. 8. Take a water shuttle over to Port Orleans, Saratoga Springs Resort, and Old Key West Resorts. Not only is the boat ride fun, but you can go look around the resorts. You might decide one of these resorts is where you want to stay on your next vacation. 9. Watch the Princess Parade that walks past the stage over toward the store Once Upon a Toy. Join the crowd and have some fun! 10. At Arribas Brothers there is a glass blower and a glass cutter on staff doing demonstrations throughout the day. 11. Head over to Characters in Flight, the hot air balloon. It floats up 400 feet in the air. Kids love watching the balloon go up and down, and this makes for great photos. 12. Window shop! There are so many stores to look around without spending a dime. There are many other things to do at Downtown Disney, but this will get you started. Have fun exploring. Here is a list of 10 things I would pack when going to Disney World. Your list may be different, so feel free to add to it! 4. First aid kit – headaches, band aids, etc. 6. My own pillow – I have to sleep on my own – get headaches if I don’t. 10. Wipes/hand sanitizer – I am a germ freak! Did you know that if you get a group together and book 10 or more rooms you can get discounts on Rooms, Tickets, Events and possbily even some Dining Package Discount too! Do you have a group of people that wants to go to Disney and get a GREAT RATE? Give me a call. Book it with several friends or family or a church group, etc. I will also apply my GIFT CARDS WITH IT TOO!! WIN WIN all around! What to do if it rains while you are at Disney? What do you do if it rains while you are at Disney? Catch a movie (and a meal! ): at AMC Downtown Disney 24. The theater’s new “Dine-In Theater” option allows you to order and enjoy appetizers, entrees, desserts and drinks from the comfort of your movie seat! Take in the Hoop De Doo Review dinner show: put on twice nightly, this wild west themed show serves up all… you can eat ribs and fried chicken. Disney Quest: a one-of-a-kind indoor interactive Theme Park bursting with five floors of games. Go for the royal (spa) treatment: Get a assage/manicure/pedicure at one of Walt Disney World’s award winning spas. Monorail Tour: The monorail travels between the Magic Kingdom and the Polynesian, Grand Floridian, and Contemporary resorts – fun places to explore, shop, and grab a meal or a snack. Everyone’s Gotta Eat: Try a new restaurant or two, if you’re willing to brave a few minutes of rain. The park restaurants are a good choice as they will be less crowded on a rainy day. Shop til you drop: You have to be slightly willing to dodge a few raindrops for this one, but there are tons of stores in Downtown Disney. Take a nap: This is not one that I would do because I would miss something but would be perfect for my husband. Brave the rain: throw on a poncho and head to the parks. It will be much quieter and you will see shorter lines.